Aled Wyn Davies has become a very familiar name to us over the last few years. Not only he has a fabulous tenor voice, but he also possesses that special talent of projecting his voice to enchant audiences all over Wales and further afield. His started his career as a folk-singer, but after winning all the important prizes in folk-singing at the Llangollen International Eisteddfod in 1999 and the National Eisteddfod of Wales in 2001, he started to broaden his horizons as a tenor soloist. Now he has become a familiar voice and face on TV, radio and concert venues all over the World. 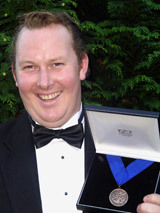 One of Aled's greatest achievements so far is the fact that he has won the national tenor solo competition three times in succession in 2004, 2005 and 2006, then he won the ultimate accolade at the Swansea National Eisteddfod of Wales in 2006 - the famous Blue Riband vocal prize (Y Rhuban Glas), and who could forget the memorable applause he received for his special rendition of the famous aria "Che Gelida Manina" from the opera La Boheme. Over the last few years, Aled has had considerable success at all of our major eisteddfodau including "International Singer of the Year" at the Llangollen International Eisteddfod in 2005, and the prestigious Blue Riband at the Cardigan Musical Festival in July 2006. In March 2006, he was approached by the renowned classical promoter Raymond Gubbay Ltd. and was invited to perform as their tenor soloist in their "Last Night of the Proms" series of concerts. This was a great opportunity for Aled, and he performed at established venues such as the Bridgewater Hall, Manchester and the Symphony Hall in Birmingham. In August 2007, he was invited by the National Eisteddfod of Wales to perform in one of the prestigious evening concerts where he shared the stage with the Eisteddfod choir, Iona Jones, Iwan Wyn Parry & Ensemble Cymru in an evening of Oratorio works. Aled has also performed at St David's Hall, Cardiff on more that one occasion. During the late 90's, Aled sang in a welsh folk group called Traed dan Bwrdd, and travelled the country entertaining audiences with humerous and popular songs. They also travelled abroad and performed five concerts in the Basque country in 2001. Aled was also a member of Cwmni Theatr Maldwyn for many years - an amateur theatre company who performed original musicals, and in 2003 he performed one of the leading roles in their last production about the Welsh hymn-writer, Ann Griffiths.This was televised for S4C and recorded on CD. During the summer of 2014, Aled accepted an invitation from Rhys Meirion and Aled Hall to join them as one of the Three Welsh Tenors, where he will travel the length and breadth of Wales and beyond. He was unveiled in December, 2014 as the new Tenor on S4C's live television programme, "Heno". Aled has been very priviliged over the last few years to sing with many outstanding performers including Gwyn Hughes Jones, Jonathan Lemalu, David Kempster and Shan Cothi and of course Rhys Meirion and Aled Hall. But surely one of the highlights must be performing the Pearl Fishers duet with Bryn Terfel at a special concert in Machynlleth in 2015. Aled has travelled on three occasions to Los Angeles to perform as guest soloist in St. David's day concerts, and in the autumn of 2003 he visited New Zealand and Australia to appear as guest soloist during Côr Godre'r Aran's three week concert tour. Over the last few years he has been singing on classical and operatic cruises on board "Minerva II" for Swan Hellenic and has visited various countries such as Thailand, Malaysia, Singapore, India, U.S.A., Mexico, Costa Rica, Italy, Tunisia, Croatia, Chile, Argentina, Falkland Islands, Patagonia, Uruguay, Brazil, Denmark, Sweden, Poland, Germany and Russia. He returned to Patagonia in November 2007 as guest soloist for Côr Godre'r Aran's three week concert tour, and in March 2008 he performed in St David's Day concerts in Johannesburg, South Africa with the Welsh choir of South Africa conducted by Dr Alwyn Humphreys. Aled's most recent overseas concerts included two performances at the famous North American Festival of Wales which was held in August 2008 in Chicago, USA; and a concert tour to Ontario, Canada in October, 2009. Recent concert performances include Handel's Messiah, Gounod's Messe Solennelle de Sainte Cecile, Maunder's Olivet to Calvary, Stainer's Crucifixion, and a concert performance of Joseph Parry's popular Welsh Opera "Blodwen" with the Dyffryn Conwy Choral Society. Aled is a prime example of the strength of the Welsh culture at its best. He is a young man who is still a farmer in his work from day to day but at the same time Aled has used his talents to the maximum by achieving his ultimate goal in the world of singing - the famous Blue Riband vocal prize (Y Rhuban Glas).